Yup. That’s the latest rumor that has been around the blogosphere about iPad 2 release date/launching date. 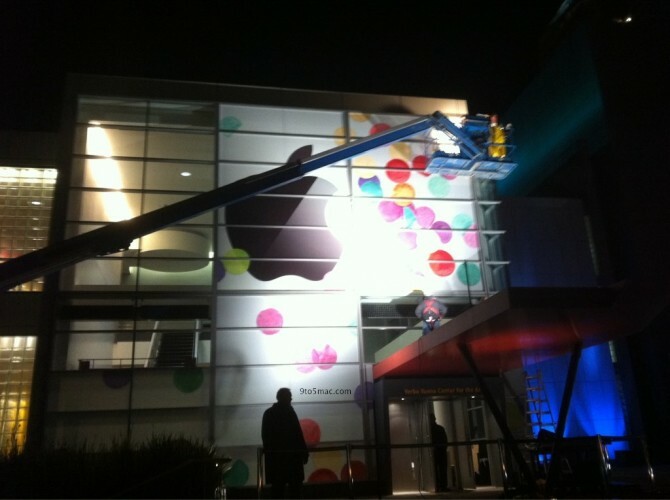 Apple preparing for the Apple Media Event at Yerba Buena Center for Arts in San Francisco. It seems that Apple has booked Yerba Buena Center for the Arts in San Francisco on March 2nd 2011 for Apple Media Event. The release date has been confirmed with promotional signage in the area stating that iPad 2 will be launched on the said date. The event will start on Wednesday (March 2nd 2011) at 10:00 AM Pacific Time. Apple will provide a live stream for those who are not invited to the event. Yeah! Finally. No more ‘Right Here Waiting’ in front of my laptop, checking the websites on the release date of iPad. With the confirmation of iPad 2 release date, now I am just wondering when will iPad 2 come to Malaysia and Singapore? This picture is released together with the invites revealing an iPad at the right corner of the picture. “Come see what 2011 will be the year of”. Will it be the year of Android tablets or iOS powered iPad 2? 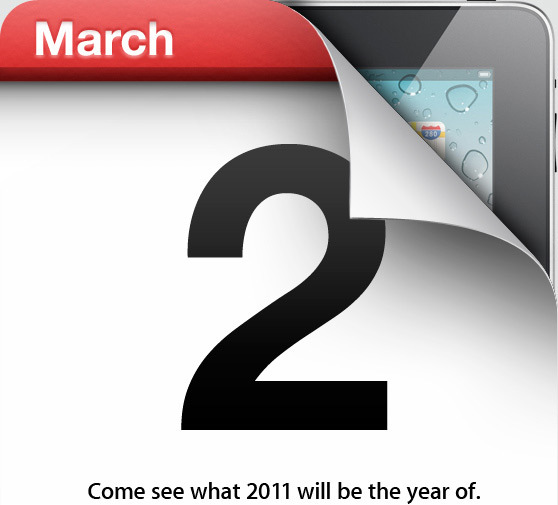 We will still have to wait until the launching of iPad 2 on March 2nd 2011. And the rumor mill has started that Steve Jobs might not be the one to unveil iPad 2 due to his health condition and his medical leave. There is still no information about who will be hosting the upcoming Apple Media Event but it’s rumored that Tim Cook, the acting CEO and Apple COO will be doing the unveiling iPad 2.
iPad 2 has been rumored to have a front camera for FaceTime video chatting. & a rear camera for taking photos and it will be slimmer than iPad. So, let’s just wait and see. I really hope that Apple will speed up the launching of iPad 2 into international markets and hope that there is no delay of shipment and production. Can’t wait to have my own iPad. When will iPad 2 come to Malaysia and Singapore? And what will be the price of iPad 2 in Malaysia and Singapore? More expensive or cheaper than iPad? Many of these questions will be answered within few more days. I’m so excited. iPad 2 launching in Singapore, South Korea and Hong Kong on April 22, 2011? It’s April 20, 2011 already. Still no news of iPad 2 in Singapore, Hong Kong and Korea? Thanks for visiting my blog and dropping a comment. It means a lot for me. That’s why I really hope that Apple will speed up the launching of iPad 2 into international markets. India got their iPad even later than Malaysia and Korea. I am not really keen to get iPad from unauthorized sellers cos I am concerning about the warranty and the quality of the stocks. Yeah. I am waiting for more information on the features of iPad 2. It seems that dual-core and retina display not in the new features. Let’s see. Heard that iPad 2 is available from a Hong Kong website, called Hong Kong Desis or something like that..
Will check it out and let you know. 🙂 Thanks for dropping by my blog and leaving comment. Thanks a lot. Next story Yet Another Related Posts Plugin (YARPP) is BETTER than LinkWithin Plugin! Previous story Official Price for MacBook Air & MacBook Pro for Malaysia Is Out!! !